I accomplished some stitching yesterday! Yay! This is “Breast Cancer Awareness” by Caroline Hofstede. This is ornament #1 for me for Stitching For A Cure (you can find the link to this pattern on that site). I’m stitching over one on 28-count again, so I chose to do the words on the back-side of the ornament – over-2, so they can be read. I need to do the backstitching, cut the pieces out, and stitch them together. I’m thinking of doing a small diamond of beads in the center of the back so it doesn’t look so bare. If you haven’t checkout out the ambitious goal Donna’s set, please visit the Stitching For A Cure blog and join in! All ornaments stitched will be placed on a Christmas tree to be auctioned off in November by the American Cancer Society. 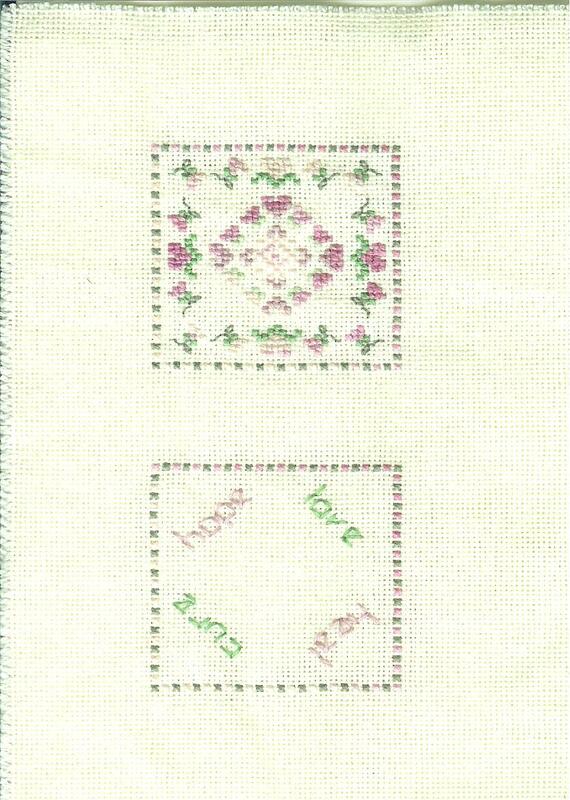 Donna has several new patterns posted in the side-bar – I printed off 2 of them the other day, and I’m anxiously waiting for a third to arrive – The Sweetheart Tree has donated a cancer awareness pattern for people stitching for this cause! My goal has grown from 2 ornaments to 5, simply because I couldn’t resist these patterns! What else have I been doing? Putting things away in my house, slaving away at the sewing machine (see Thursday’s post), and thinking about learning blackwork. I’m having a hard time finding information about it, which is probably why I want to learn it, lol. I also want to get back to doing the Hardanger tutorial lessons (does anyone remember where I left off?) – that was, after all, the purpose of this blog. Until next time, may your stitches be many and your knots be few! What a great reminder! Thanks I went to the sight and inquired and forgot all about it in my menopausal state. Thanks again, the stitchery is beautiful hope all is well with the new house!